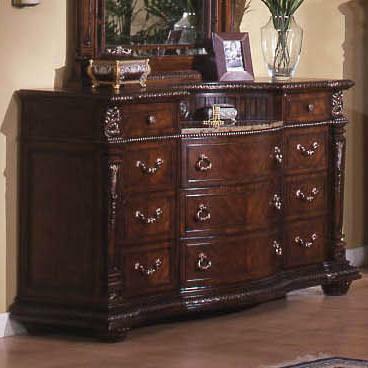 Bring spectacular eye appeal to your room with this eleven-drawer dresser. 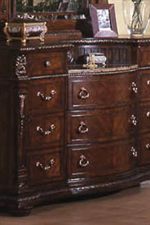 The multi-sized drawers provide convenient storage while featuring felt-line top drawers, bowed drawer fronts, and antique, brass finished hardware, all blending with the dresser's traditional style. 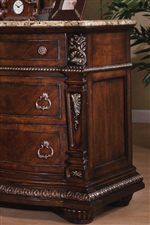 Adding detail to elegance, the tiered dresser top shows off an embossed gallery with a laminated marble top, while the body is highlighted with beading, overlays, and exquisite shapes. 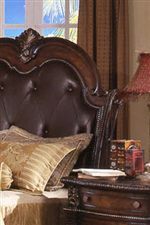 All topped with a brown cherry finish, this dresser is great to pair with its coordinating mirror to achieve the complete look. 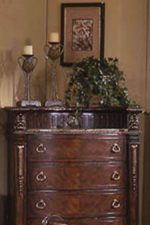 The Coventry Traditional 11-Drawer Dresser with Laminated Marble Top and Bowed Drawer Fronts by Holland House at Miskelly Furniture in the Jackson, Pearl, Madison, Ridgeland, Flowood Mississippi area. Product availability may vary. Contact us for the most current availability on this product.